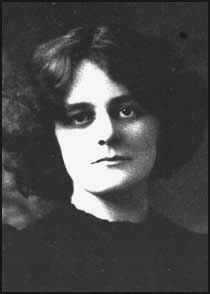 Maud Gonne was born near Aldershot, in England, probably on 20 December 1865. Her mother died in 1871 and, when her army officer father was posted to Dublin Castle in 1882, she acted as his hostess. Col. Gonne died in 1886, and Maud and her sister lived briefly with an uncle in London. Contracting a lung haemorrhage, she was sent to recover to the French Auvergne, where she met Lucien Millevoye, a journalist and politician whose marriage had broken down. She was to bear him two children before their affair ended in 1898. The couple agreed to work together for Irish independence and for French recovery of Alsace-Lorraine from Germany. Millevoye suggested that Maud, though English, could become Ireland's Joan of Arc. With W. B. Yeats, she founded an Association Irlandaise in Paris, but rejected his marriage proposals. She joined the secret Irish Republican Brotherhood, and attracted police attention in Ireland by her protests against eviction and against celebration of Queen Victoria's diamond jubilee. In 1900, she founded Inghinidhe na hÉireann (Daughters of Ireland), a women's republican movement, and opposed Boer War recruitment. In 1902, she played Yeats' Cathleen ni Houlihan, symbolising Ireland's struggle when she shed the appearance of an old crone to become 'a young girl with the walk of a queen'. In 1903, she married in Paris Maj. John MacBride, who had formed an Irish brigade to fight on the Boers' side; their marriage failed, and he returned to Ireland, where he was executed after the 1916 rising. She spent most of her time in France. Returning to Dublin, she was interned in 1918 and spent some months in Holloway prison in London. She organised relief during the War of Independence, and assisted republican prisoners and their dependants during the Civil War.Imprisoned in 1923, she was released after going on hunger strike. In 1938, she published an account of her early life, A Servant of the Queen. From 1922, she lived at Roebuck House, Clonskeagh, Dublin, where she died on 27 April 1953.